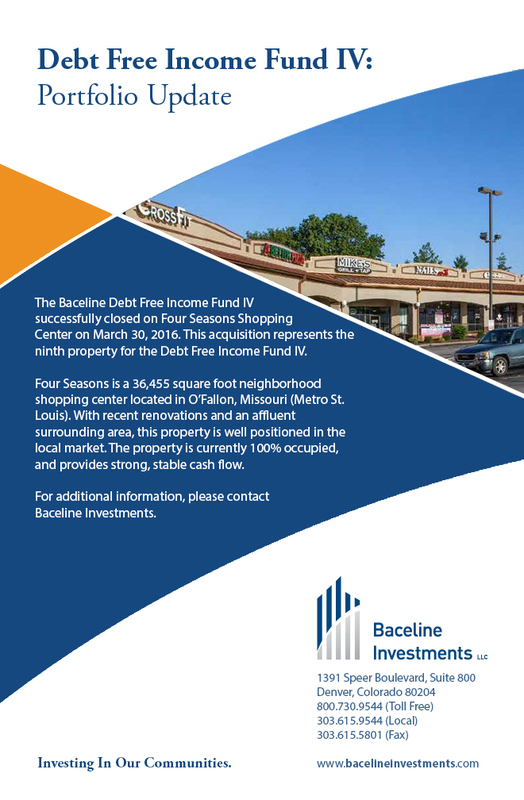 The Baceline Debt Free Income Fund IV successfully closed on Four Seasons Shopping Center on March 30, 2016. This acquisition represents the ninth property for the Debt Free Income Fund IV. Four Seasons is a 36,455 square foot neighborhood shopping center located in O’Fallon, Missouri (Metro St. Louis). With recent renovations and an affluent surrounding area, this property is well positioned in the local market. The property is currently 100% occupied, and provides strong, stable cash flow. For additional information, please contact Baceline Investments.